Theft from a home in Livingston County was investigated Monday and Livingston County Sheriff Steve Cox says they have a suspect in custody. The victim reported a vehicle broken down near the home and a woman was asking to use the restroom. The resident had some money tucked away near the area and when the woman left the cash was missing. The suspect was located, and Sheriff Cox says she was uncooperative and denied having the money. A female office made a search of the woman and found the money on the woman. 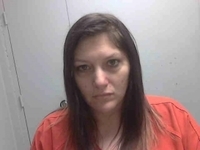 They arrested 39 year old Frances Alicia Groom, also known as Frances Stagner, of Gallatin for alleged stealing. She is held at the Daviess Dekalb Regional Jail with bond set at $15,000.